CannabisNewsWire Editorial Coverage: Moments prior to signing a historic 2018 Farm Bill and effectively legalizing industrial hemp, President Donald Trump tweeted out a video of his performance at the 2005 Emmy Awards, singing the song “Green Acres.” Having already passed through the House of Representatives and the Senate, the bill was met with much fanfare across nearly the entire cannabis sector, including benefactors such as Green Growth Brands (CSE: GGB) (OTCQB: GGBXF) (GGB Profile), Cronos Group, Inc. (NASDAQ: CRON) (TSX: CRON), Canopy Growth Corporation (NYSE: CGC) (TSX: WEED), Harvest Health and Recreation (CSE: HARV) and MedMen Enterprises Inc. (CSE: MMEN) (OTC: MMNFF). Trump’s signature was the last hurdle for the $867 billion bill. Now the market is gearing up for the massive potential of hemp-derived cannabinoids hitting stores. Among the benefactors of the passage is Green Growth Brands (CSE: GGB) (OTCQB: GGBXF), whose goal it is to become the leading retailer of cannabis and CBD products in North America. Under its Seventh Sense brand, the company is about to market its own line of hemp-derived cannabidiol (CBD) personal care products. 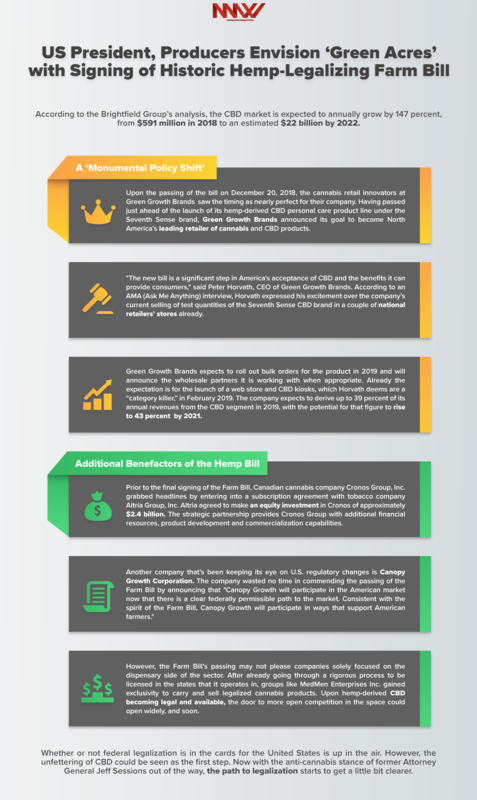 Back in September 2018, the market research firm Brightfield Group published a 2018 market overview and analysis on hemp-derived CBD. Among the observations made in the report was the possibility that the CBD market could eclipse the cannabis market. Less than three months after the report’s release, the Farm Bill’s passage significantly improved this possibility. According to the Brightfield Group’s analysis, the CBD market is expected to annually grow by 147 percent, from $591 million in 2018 to an estimated $22 billion by 2022. Upon the passing of the bill on December 20, 2018, the cannabis retail innovators at Green Growth Brands saw the timing as nearly perfect for their company. Having passed just ahead of the launch of its hemp-derived CBD personal care product line under the Seventh Sense brand, Green Growth Brands announced its goal to become North America’s leading retailer of cannabis and CBD products. Green Growth Brands expects to roll out bulk orders for the product in 2019 and will announce the wholesale partners it is working with when appropriate. Already the expectation is for the launch of a web store and CBD kiosks, which Horvath deems are a “category killer,” in February 2019. The company expects to derive up to 39 percent of its annual revenues from the CBD segment in 2019, with the potential for that figure to rise to 43 percent by 2021. Current company estimates place the dollar figure of the annual revenue from this segment at roughly $59 million for fiscal year 2019. Due to Green Growth Brand’s overwhelming amount of c-level retail sector experience, Horvath and his team have a healthy degree of authority on their expectations. The company roll call includes expertise from several household names, including Victoria’s Secret, Designer Shoe Warehouse, American Eagle Outfitters, Bath & Body Works and more. Branding is a quintessential aspect of Green Growth Brands’ future success. The team’s strategy is focused around being the best brand, coming from what it calls an “emotional brand” perspective. The company has an array of brands — including Camp, Meri+Jayne, Seventh Sense and Green Lily — all of which will be utilized for both CBD and cannabis purposes. To move its CBD products to market, the company will have three separate strategies: wholesale, e-commerce and kiosks. The latter strategy is an indication of Horvath and his team’s extensive retail knowledge, as they work to grow their brand. Kiosks help to reduce leasing costs for retail exposure while selling brand-specific emotional brands at a relatively inexpensive price. One executive on the team had significant success with this strategy as a former executive of Sunglasses Hut. By the end of 2019, Horvath’s company expects to have approximately 1,400 SKUs on the market. Should it reach this goal, Green Growth Brands would have a strong case for dominating the CBD products market. The timely passing of the 2018 Farm Bill may only serve to speed up the process. Prior to the final signing of the Farm Bill, Canadian cannabis company Cronos Group, Inc. (NASDAQ: CRON) (TSX: CRON) grabbed headlines by entering into a subscription agreement with tobacco company Altria Group, Inc. Altria agreed to make an equity investment in Cronos of approximately $2.4 billion. The strategic partnership provides Cronos Group with additional financial resources, product development and commercialization capabilities. Cronos is one of the few Canadian producers listed on a major U.S. exchange, while not having any current operations in the country. Another company that’s been keeping its eye on U.S. regulatory changes is Canopy Growth Corporation (NYSE: CGC) (TSX: WEED). The company wasted no time in commending the passing of the Farm Bill by announcing that “Canopy Growth will participate in the American market now that there is a clear federally permissible path to the market. Consistent with the spirit of the Farm Bill, Canopy Growth will participate in ways that support American farmers.” Canopy already has a deep hemp-specific portfolio of intellectual property through a previous acquisition of Colorado-based ebbu, Inc. In addition, much speculation has surrounded the potential for the company’s ongoing partnership with Constellation Brands to develop new cannabinoid-infused products, which will likely include a line (or multiple lines) of CBD drinks. Following the closing of a reverse takeover of RockBridge Resources, Inc., vertically integrated Harvest Health & Recreation (CSE: HARV) announced the acquisition of Colorado-based CBx Enterprises, a producer of cannabis products and technologies for extraction and processing. Harvest’s footprint spans across 10 states, including California, Colorado and Massachusetts. The company reported revenue of $29 million in 2017 and has made $18 million in investments resulting in 40 permits and licenses across the United States. Having focused its attention solely in the United States, Harvest has no immediate plans for international expansion. With each regulation change in the Farm Bill, the company’s fortune appears to look brighter. However, the Farm Bill’s passing may not please companies solely focused on the dispensary side of the sector. After already going through a rigorous process to be licensed in the states that it operates in, groups such as MedMen Enterprises, Inc. (CSE: MMEN) (OTCQX: MMNFF) gained exclusivity to carry and sell legalized cannabis products. Upon hemp-derived CBD becoming legal and available, the door to more open competition in the space could open widely. MedMen doesn’t seem to be fazed by the passing, having recently announced the finalization of the acquisition of Chicago-based PharmaCann, one of the largest medical cannabis providers in the United States, with ten retail stores and three production facilities across multiple states. Whether or not federal legalization is in the cards for the United States is up in the air. However, the unfettering of CBD could be seen as the first step. Now with the anti-cannabis stance of former Attorney General Jeff Sessions out of the way, the path to legalization starts to get a little bit clearer. With the majority of Americans, including Republicans, now in favor of legalization and a bevy of CBD-infused products on the way, the days of cannabis prohibition may be on their way out. With a soon-to-be-launched line of hemp-derived cannabidiol (CBD) personal care products, Green Growth Brands is poised to enter the potential billion-dollar CBD market opened up by the Farm Bill’s passage. For more information on Green Growth Brands, visit Green Growth Brands (CSE: GGB) (OTCQB: GGBXF). Please also visit PotStockNews.com.